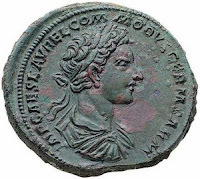 The first born son of Marcus Aurelius and Faustina the younger, Commodus was born in 161 with the name Lucius Aurelius. The name Commodus was given to him in honor of Lucius Verus, who was born with that name. With an eye toward dynasty, he was named Caesar by his father, Aurelius while still a child. His path to the throne was enhanced by the rapid accumulation of titles, which included Germanicus, Sarmaticus, and Imperator, and he was also made tribune. The ultimate title of Augustus was bestowed on him in 177, and sole reign began in 180 after the death of Marcus Aurelius. This was the first true genetic dynastic succession of father to son in several generations. Young portrait, with titles Germanicus, Sarmaticus. Commodus possessed a self-absorbed megalomania, together with the paranoia that accompanies the associated eccentric behavior. Plots against him soon developed, one of the earliest involving the widow of Lucius Verus, Annia Lucilla, and her husband, Tiberius Claudius Pompeianus, who had eyes on the throne himself. Commodus banished the couple and later had them executed. Another plot involved Tigidius Perennis, Commodus' commander of the guard. When that plot was quelled, Commodus awarded himself the title of Felix, in celebration of his victory. Part of the fruit of Commodus' self-adoration was his desire to leave a lasting reminder of his historical importance by renaming Rome itself in his memory. Rome was to be known by the new name Commodiana. Other cities and military legions were renamed in his honor. Another outgrowth of his delusions of grandeur was his self-identification with Hercules.. He saw himself as the living embodiment of Hercules, and saw himself as the Royal Huntsman, and as such, he entered himself into gladiatorial competitions, in which he slaughtered exotic animals. He had himself depicted on his coinage as Hercules wrestling a lion. He wore the skin of a lion and carried a club to cement his image as the personification of the deity. He also referred to Hercules as his companion, furthering the association between the emperor and the divine, a quality picked up on by later emperors to enhance their power and authority. 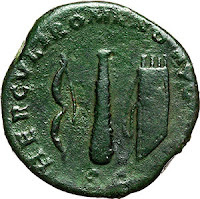 Sestertius, club of Hercules, bow and arrow quiver. Surprisingly, despite his eccentricity, Commodus had a relatively long reign for a Roman emperor, one of twelve years. The time did arrive eventually, when people had enough of his behavior and resultant policies. A praetorian prefect, Quintus Aemilius Laetus, put together a plot to replace Commodus with Pertinax. The plot involved several people close to the throne, including his mistress and others in the court. The political base for the coup included several future emperors of Rome, including Septimius Severus, Pescennius Niger, Clodius Albinus, and Pertinax. A wrestler named Narcissus was enlisted to strangle Commodus on the last day of the year 192, which he did. 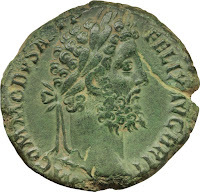 The coinage of Commodus often portrays him in fine detail in the persona of Hercules, complete with lion skin head dress, often with a club somewhere in evidence on the coin. 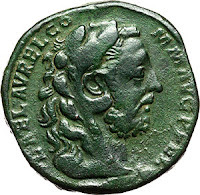 Commodus sought to be referred to as Hercules, the son of Jupiter, and this too was reflected on his coinage. 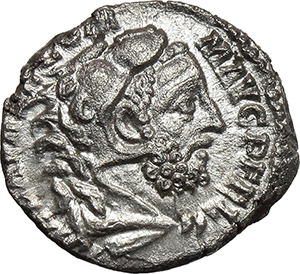 Portraiture of Commodus on coinage ranges from that of a young child, on his father's coinage, when elevated to Caesar, to that of a mature adult, in some cases looking rather aged, despite his young age at death. 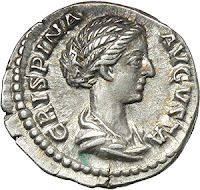 Also commonly depicted on his coins was the bust of his wife, Crispina. 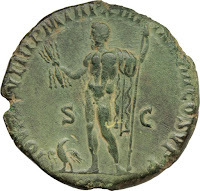 Sestertius, portrayed as Hercules, fine style.